Shopping at yard sales can be a fun way to spend the weekend when you’re in the mood for sunshine and great deals. Whether you’re looking for something specific or just want to browse through other people’s discarded treasures, yard sales can offer the items you covet for a fraction of their original retail prices. Do you need help learning how to bargain and shop at these fun outdoor neighborhood venues? If so, you’ve come to the right place! Below are tips on how to get the best possible bargains at yard sales. A shopping list helps you stick to your budget and serves as a reminder of what you’re looking for, even if you might not find everything you want. If you don’t see any of the items on your list, ask the seller! Sometimes, sellers are willing to give up items they’re not using consistently, even if they weren’t planning on selling them in the first place. If you show up to yard sales looking as if you just stepped off the runway in high-end brands such as Gucci and Versace, chances are you’re probably not going to get great bargains. Instead, dress down to look more casual and comfortable. When you look the part, sellers are more willing to come down on price. Leave your home early in the morning to nab the best items before anyone else, especially if you’re looking for electronics and furniture, which are known to sell first. On the other hand, if you’re looking to score deals on items like knick-knacks and clothing, go later in the afternoon, when sellers are more willing to discount items to avoid having to pack them back up. If all you have on hand are $20 and $50 bills, you might face difficulty with getting great deals. Most sellers won’t have lots of change, and might not budge on price if they know you can afford to spend more. Bring a bag of loose change and dollar bills so you can easily pay for items that cost under a dollar. When you first arrive at a yard sale, find the seller and smile, make eye contact, and say hello. This makes you seem friendly and approachable, which can help you close a deal more effectively if you find something you want. 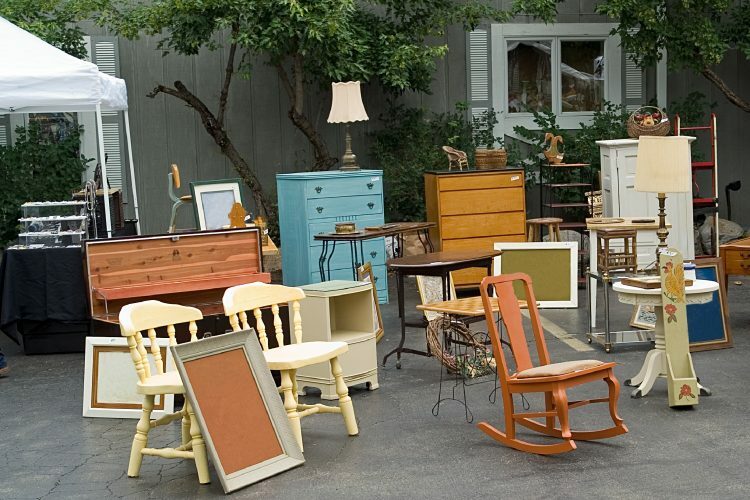 Strike up a casual conversation about the weather or the yard sale itself to establish a warm, personal connection. If an item isn’t marked, ask the seller how much they want, then make your own counteroffer if their price is higher than what you’re willing to pay. Try to avoid sharing how much you’re willing to pay upfront, since sellers might trick you into paying more than what they feel the item is worth. The more items you buy, the more sellers are willing to come down on pricing. Before you approach the seller to make your purchase, add up the prices of your items and knock off an overall percentage or a few bucks. Sellers are usually willing to make reasonable offers on bulk purchases since you’re helping take unwanted items off of their hands. If you’re shopping for electronics, toys, and other battery-powered items, bring along screwdrivers and batteries to test products before you buy them. If items are electric, ask buyers if you can test products in an electrical outlet before taking them home. When you go hunting for yard sales this weekend, don’t hesitate to try out the above tips and tricks! You might just end up coming home with some items you’ve had on your wish list for years.